ANYWAY... All those odds and sods of books that we all manage to collect because we don't actually want them any more - you know when you do a bit of a cull, or you have an impulse buy that maybe you shouldn't have? How about making one of these? I hate to think of the possible council issues that might arise, but if you can put up a letterbox, surely a biggish one could be adapted and popped up in the same way. Food for thought! This is a totally cool concept! We actually have this in our village. I hope more places will have them though. 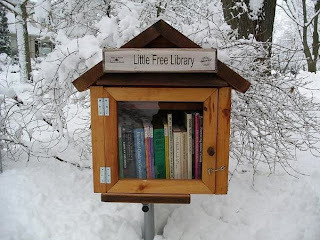 They are a great idea, I am sure I saw a story a little while ago about a man who started a sort of informal library with a a few books and invited people to add to the collection as they saw fit and the whole community benefitted and it just grew. I wish I could remember the details, it was somewhere in the Asian region in a relatively poor local community but I can't remember much more than that. Here I am sure we would get hit with all sorts of council and ohas regulations, which is kind of sad really. On Facebook (I link my posts to my page there) I've had comments from a couple of people. One says we should have this at the church where I work - we already keep a free shelf of books for the homeless people in the area (Sydney CBD) but that's only accessible when the church is open during the day. However, as I said to her, we'd run into problems with both the council and the Heritage authorities, as erecting ANY kind of fixed structure within the grounds means jumping through so many hoops it's ridiculous. The other person suggested having them at the railways stations, which I thought was brilliant! Cityrail may also put up some blocks, but could possibly be easier nuts to crack. I love the idea of book-bombing places so there's free access to books...! This really is great! I tend to hoard books so I don't know that I'd be able to make it happen, but it really is an awesome idea. I really want to start participating in book crossing as well. They do still do that, right? I don't even know if it's just an American thing or an international thing. I cull - I have no choice...limited space, and also the realisation that I do end up with books that aren't going to be re-read, in which case they have to go to make room for those that will! Book crossing... Haven't heard of that - what is it?